Cleansing: It helps to remove the dirt and grease. Toning: It removes the dirt traces as well as any cleanser remnants. And …. Moisturizing: It helps your skin turn supple and smooth. Face washes act as good cleansers and specifically effective when used in oily skin. There are several brands and forms of face washes for oily skin available in the market. So, you can always lay your hands at the best face wash for oily skin. Before getting into details on how to get rid of oily skin, it is must to know the causes of occurrence. Oily skin can be the result of genetics, production of hormones as well as several other factors. The “Oil” that is known as “Sebum” by the cosmetic and medical professionals is produced in the skin’s second layer and then it gets to your skin and hair for hydration. Tricky part for oily skin is when sebum is generated in huge quantity then it makes your skin look unhealthy, dirty and sweaty. As a result, it leads to acne spots, congested pores, blackheads and even worse. Using the best oily skin face wash will help you to alleviate the problem at ease. Among so many face washes available, you might feel it a problem to find the best one, isn’t it? Actually not as the best face wash for oily skin will remove the lifeless skin cells and dirt in gentle way. Glycolic cleansers exfoliate your skin without over-drying or scrubbing your skin. Glycolic acid (Alpha Hydroxy Acid) helps to cut oil in high concentration level. Salicyclic Acid (Beta Hydroxy Acid) also referred to as fever reducer can neutralize bacteria in pores and prevent them to build clogging. The BHA formula also works for those who suffer from skin problems including Calluses and psoriasis. When the two is blended in a face wash for oily skin then you can be sure to get the best effect on your skin. Even it can help to prevent acne and the breakouts in future. So, always use a face wash containing either or both of them. Given below are the three best face wash for oily skin. Using glycolic acid cleanser on regular basis will freshen up your skin as never before. The blend of salicyclic acid, jojoba beads and glycolic acid helps you to lessen the clogged pores, removes oil build-up, dirt and dead skin cells. The product acts more than face wash which not only cleans up dirt from the surface but its strong ingredients gives the feel of deep cleaning that is impossible to be matched. This mild face wash gives enduring benefits to your skin complexion by lessening the dark spots, age spots, other discoloration forms (if any) thereby preventing the acne scars, acne and signs of early ageing. 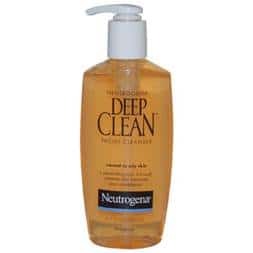 Dermatologist tested product neutrogena deep clean facial cleanser can be used for normal to oily skin. It improves the feel as well as look of your skin. It cleans your skin deeply that it is left without any pore clogging residue. This oil free face wash comprises of hydroxyl acid that breaks through deeply into your skin pores thereby dissolving the makeup, dirt and oil. Other than these, the product helps to remove the dead skin cells from the surface which can dull, dry or roughen your complexion. Your skin will look healthy and fresh ever when using the product regularly. 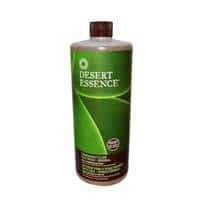 The desert essence is a gentle face wash comprising of organic tea tree oil (natural antiseptic) that cleanses your skin without making it feel too dry or tight. As a result, your skin will become smooth as well as silky. The product includes extracts of skin soothers such as Goldenseal, Chamomile essential oil and white ginger from Hawaii that will give a natural glow to your skin. Along with it contains Bladderwrack that is enriched in mineral to improve your skin radiance thereby bringing more texture and clarity. Nothing can be good than using a chemical-free natural cleanser that exfoliates and smoothes your skin up.